Determined to deliver safe and effective services that are tailored to your energy company's needs. Each service company provides its clients with the expertise and experience to get the job done correctly the first time. The Hartman Oil family of companies provides complete oil and natural gas drilling, well servicing, trucking, equipment, and repair services. These are offered separately, or as a package to best suit your oil production needs. With over nine decades of experience, we provide the best of both worlds; the knowledge and resources of a large and long-lived company, combined with the care and timely responses of a family-owned business. 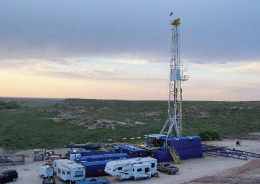 H2 Drilling operates 3 modern drilling rigs covering the primary areas of central and western Kansas, and has drilled in southwest Nebraska, eastern Colorado, and in the panhandle of Oklahoma; can drill to maximum vertical depths of 10,000 ft.
H2 Trucking transports oil field equipment, to include drilling rigs and pipe throughout Kansas, Nebraska, Colorado, Oklahoma, and Texas. 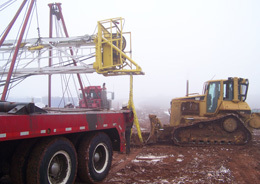 H2 Trucking also provides dozer and dirt work services, which includes preparing drilling sites, building tank batteries and lease roads, back-filling open drilling pits, and on-call snow removal service. 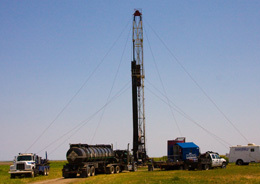 H2 Plains operates 14 well-servicing rigs which specialize in down-hole rod and tube service, completions, work-overs, well wash-downs, and mud-pumping services. 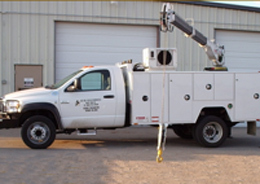 H2 Oil Field Services provides in-shop repairs and mobile repair services for drilling rigs, pulling units, medium-heavy trucks, and other heavy equipment.